At J. Ralph Moore, our attorneys provide skilled representation to individuals and families facing family law, estate planning, personal injury and real estate matters. We understand the impact these situations can have on your life, and we create the legal solutions that you need during uncertain times. Our lawyers will take the time to sit down with you and understand what you are facing. We are committed to helping our clients get through these times. Our team of attorneys is respected throughout Oklahoma for their ability to get results. From the first consultation, we will take care of you as if you were family. This includes listening to your concerns and providing real answers and information that you can use to make the best decisions for you and your family. We always return phone calls quickly. 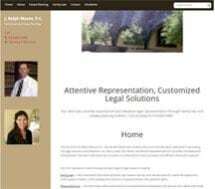 Our clients appreciate this level of attention and concern, and many return to us for other legal matters knowing that we will take care of them. If you would like to schedule a consultation to discuss your legal matter and how we can help, please contact our Pryor, Oklahoma, law offices today.